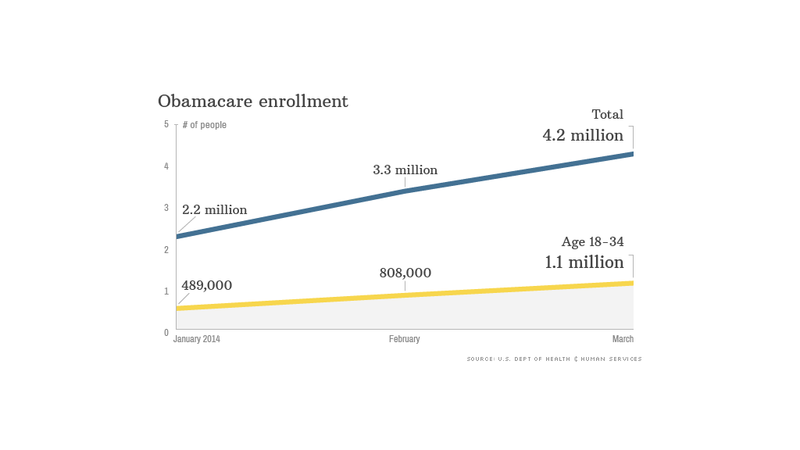 4.2 million have signed up for Obamacare as open enrollment nears close. More than 4.2 million have signed up for insurance on the Obamacare exchanges through February, leaving the administration with one more month to hit its enrollment targets. It remains to be seen whether enrollment will hit the non-partisan Congressional Budget Office's projections that 6 million people would enroll in the exchanges for 2014, though many insurers have said sign-ups were running close to expectations. Administration officials would not say Tuesday whether they expect to hit the CBO target, nor would they give their own goal. "We do believe millions more Americans will come in and enroll in coverage before the March 31 deadline," said a spokeswoman for Centers for Medicare & Medicaid Services. "Many consumers choose to make this decision very close to their deadline." Sign-ups slowed last month, with fewer than 950,000 picking plans, according to federal data released Tuesday. Administration officials cited the shorter calendar month as one reason for the slowdown. Not all of these people have completed enrollment by paying their premiums. Officials said they don't have a tally of how many people have paid yet, but insurers interviewed have indicated the figure is running in the 80% range. Those who don't pay will have their policies voided. It's also unclear how many of those who've signed up were previously uninsured -- a key target group of health reform. Officials said they don't have figures yet, but pointed to outside studies that showed some uninsured are gaining coverage. Gallup reported Monday that the percentage of Americans without health insurance fell to 15.9% in 2014, compared with 17.1% in the fourth quarter last year. The administration and advocacy groups are hoping to boost sign-ups in the final days of open enrollment, which ends March 31. They have launched an advertising and outreach campaign aimed at younger Americans, blacks, Latinos and lower-income folks in particular. Administration officials reiterated that they will not extend enrollment beyond this month. President Obama gave his pitch for signing up on Zach Galifianakis' Funny or Die talk show Between Two Ferns, which appeared online Tuesday. Some 32,000 people who watched the video then clicked on healthcare.gov, officials said. Tuesday's report also provided a look at who is signing up for coverage. The number of young people picking policies surpassed 1 million in February, but their share of sign-ups remained steady at 25%, lower than projected. Younger enrollees are crucial to Obamacare's success because they are thought to be healthier and less expensive, and insurers are hoping to attract those ages 18 to 34 to offset costs incurred by older, sicker enrollees. If not enough enroll, it could cause next year's premiums to jump. Also, 83% of people signing up for policies were eligible for federal subsidies to defray the cost of premiums and out-of-pocket costs.